Diffusers are incredible little devices. They can not only provide (usually) much needed humidity to your home or office, but also a multitude of therapeutic benefits through the diffusion of essential oils. You may be curious however, how they do it! In this article we’ll outline how the two main types of diffusers work – ultrasonic and nebulizing – which also may help you choose between the two if you happen to be debating. Ultrasonic diffusers disperse their essential oils into the air by being carried in tiny micro-droplets of water vapour. The water is converted from liquid into water vapour using ultrasonic vibrations. These ultrasonic vibrations are actually produced by a vibrating disc that produces sound waves at an ultrasonic frequency which we can’t actually hear. The waves churn the water within the reservoir of the diffuser – which also contains the essential oils – at such a high rate, it actually converts the water to vapour, or mist, which then disperses throughout your room. 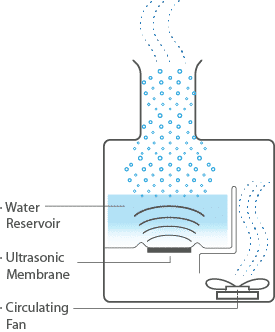 The ultrasonic waves also disrupt the oil bubbles within the water and trap them inside the water droplets, which is how the smell and therapeutic effects of the oils are carried throughout your space. A nebulizing diffuser works a little bit differently from an ultrasonic diffuser. The main difference is that a nebulizing diffuser does not require a water reservoir, nor do the essential oils being diffused do so through a carrier water droplet. Instead, these diffusers work through a scientific principle called Bernoulli’s Principle, a fluid dynamics theory of physics. 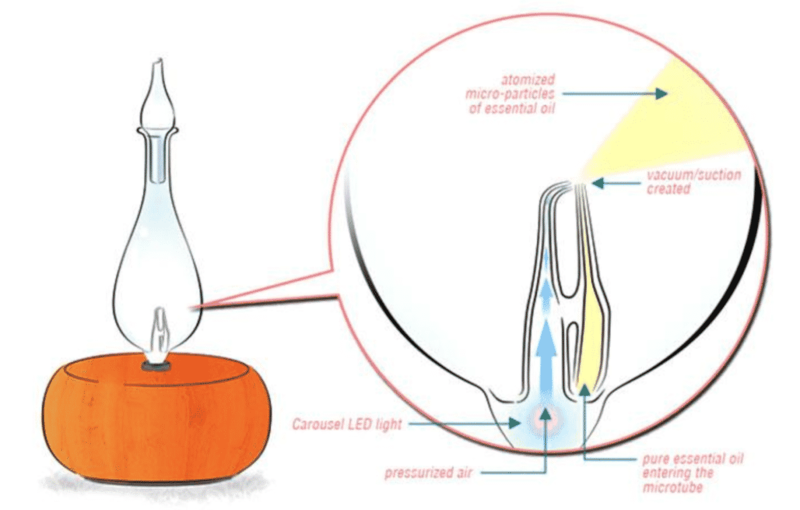 In nebulizing diffusers, air is shot through a small tube at a very high velocity, it also produces a difference in pressure within the tube – that is, the pressure near the exit of the tube is lower. The pressure difference produces a suction-like effect causing the essential oils at the base of the tube to be sucked up towards the top of the tube. 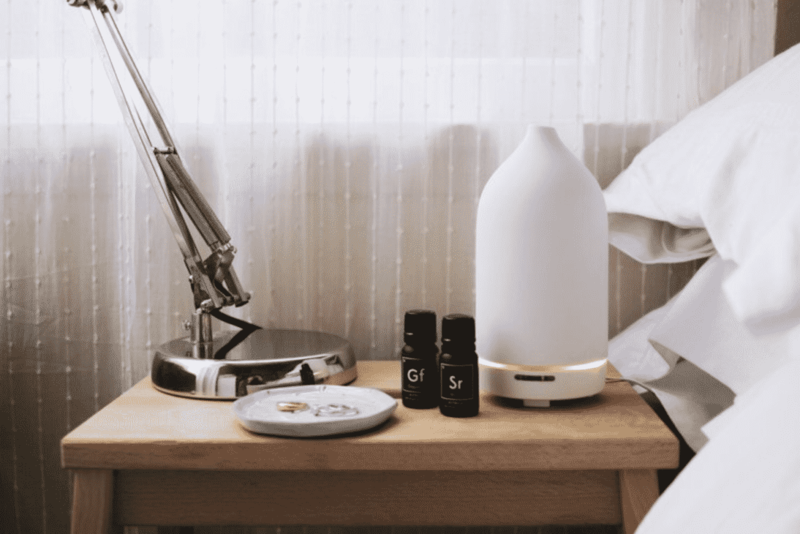 The combination of the rising essential oils and the stream of pressurized air produces a similar effect to an ultrasonic diffuser – the essential oil molecules atomize into tiny particles in a waterless mist that disperses throughout your room. Which Type of Diffuser is Best? If you’re trying to decide between an ultrasonic or nebulizing diffuser, it can be a tough choice since they both have their own unique set of benefits and drawbacks. Nebulizing diffusers typically produce better therapeutic effects, since they release essential oils directly into the environment and is not diluted through water vapour. However, they are a little more expensive typically, and don’t humidify the air. Ultrasonic diffusers are typically more affordable, however are slightly less effective than nebulizers since the oils are carried through water vapour droplets and subsequently diluted. However, they can provide therapeutic effects and also humidify your space simultaneously. To learn more about the types of diffusers and to help you decide, check out our list of the best essential oil diffusers of 2019.